Dr. Seuss was an inspiration to me as a young artist. I loved his whimsical drawings and fanciful landscapes. 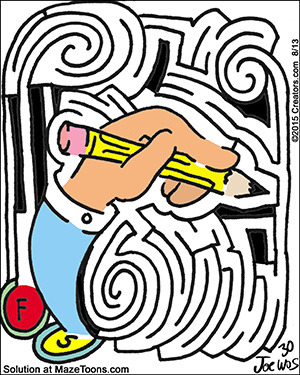 You can see some of his influence in my abstract mazes and monster mazes too. Seuss created a world of comical coordinated chaos. Every line had it’s proper place and yet it always seemed delightfully out of whack! Here are a few mazes where you can see his influence on my work. Next It’s a jungle out there!